SEQAEP Teaching Job Circular 2016 found here. Secondary Education Quality and Access Enhancement Project (SEQAEP) announces will recruit 1500 vacancies for Additional Class Teachers (ACTs) for the year 2016. SEQAEP New Job circular published on 01 July 2016. Interested and eligible candidates are requested to apply after fulfilling the circularized conditions and instructions. Deadline for Submitting Application is 21 July 2016. 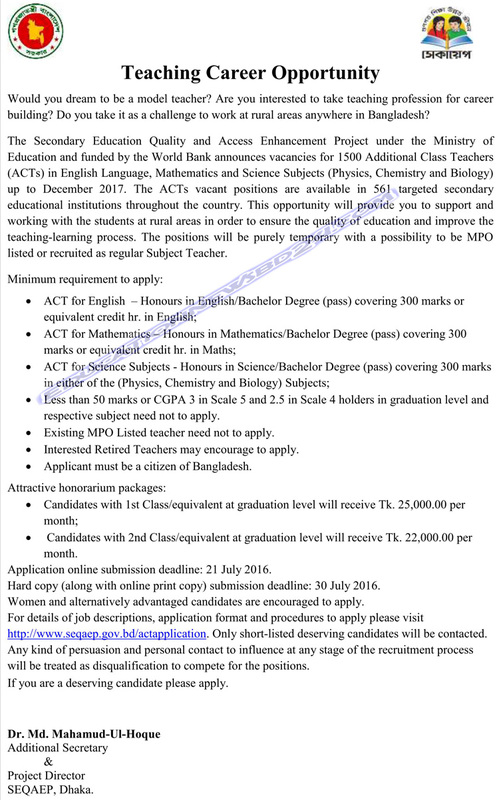 Secondary Education Quality and Access Enhancement Project (SEQAEP) under the Ministry of Education Bangladesh and funded by the World Bank announces vacancies for 1500 Additional Class Teachers (ACTs) in English Language, Mathematics and Science Subjects (Physics, Chemistry, and Biology) up to December 2017. The Secondary Education Quality and Access Enhancement Project (SEQAEP) under the Ministry of Education Bangladesh Additional Class Teachers (ACTs). Gender: Women and alternatively advantages candidates are encouraged to apply.